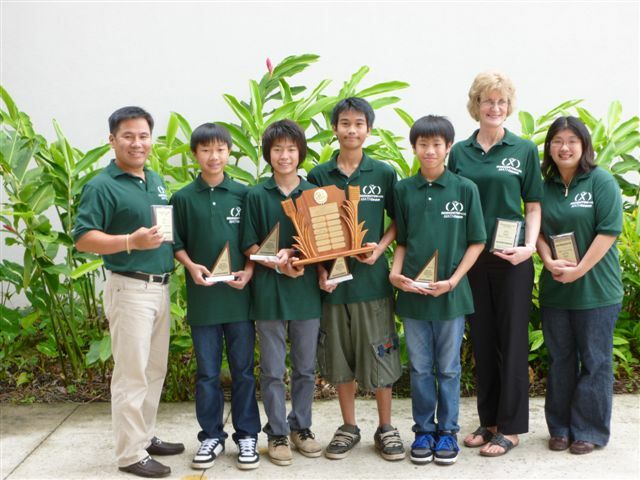 The Hawaii MathCounts Committee has announced the winners of the 29th Annual State MathCounts Competition held Saturday, March 3. The top four students  David Chang and Jion Kato of Washington Middle School, Mark Klein of Punahou School and Jesse Doan of Seabury Hall  will now comprise the Official Hawaii State MathCounts team and represent Hawaii at the National Competition in Orlando, Florida on May 11, 2012. The team will be led by Washington Middle School math coach Mr. Sung Park, whose team captured first place honors at the Oahu Chapter and Hawaii State competitions. In addition to winning the state competition, the Washington Middle School team placed first in the Oahu Chapter competition on February 25. MathCounts is a national enrichment, coaching and competition program that promotes middle school mathematics achievement. Akin to a sports event, students must compete in a series of rounds designed to challenge their math skills, improve problem-solving abilities and sharpen logical thinking and analytic skills. 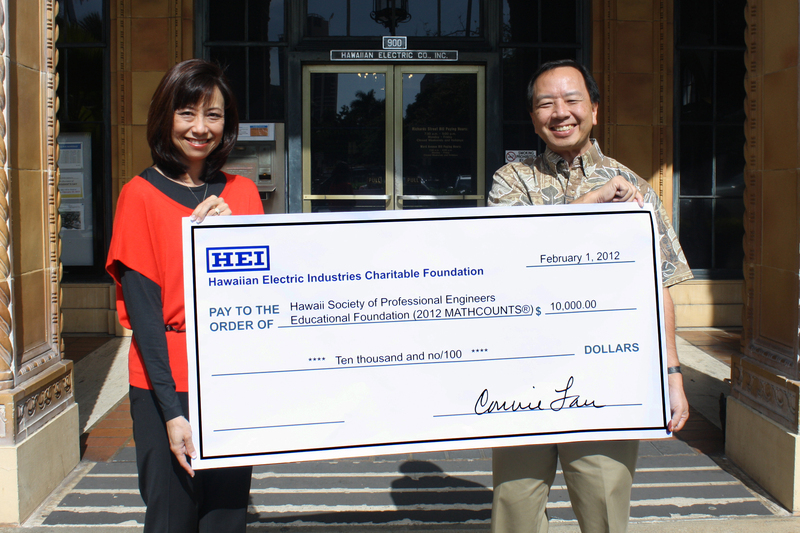 Since 1984, Hawaiian Electric Company has proudly supported the MathCounts competitions in Hawaii, which are organized by the Hawaii Society of Professional Engineers and a steering committee. The MathCounts program provides students with an opportunity to challenge their math skills and develop self-confidence, while inspiring them to pursue careers in math, science, technology and engineering. Photos courtesy MathCounts. 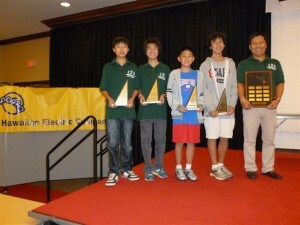 Top: The 2012 Hawaii State MathCounts Team (left to right): David Chang and Jion Kato of Washington Middle School, Jesse Doan of Seabury Hall, Mark Klein of Punahou School, and Math Coach Mr. Sung Park of Washington Middle School. 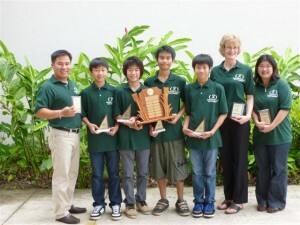 Middle: The 2012 Oahu Chapter MathCounts Competition winning team, from Washington Middle School (left to right): Coach Sung Park, David Chang, Jion Kato, Jason Maligon, Anthony Nguyen, Coach Candy Ewell, and Coach Charlen Taniguchi. 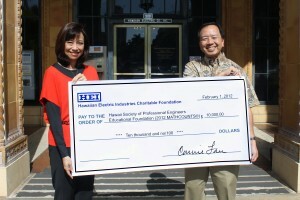 Bottom: The check presentation to the Hawaii Society of Professional Engineers Educational Foundation, featuring Lynne Unemori, vice president of Corporate Relations at Hawaiian Electric Company and Barry Nakamoto, Treasurer of the HSPE.